1941 Mi.48, Landscape 0,50K black-blue, imperforated sheet OMITTED PRINT in almost middle of area (complete 4 lower lines); rare! 1941 Mi.60, strip-of-20 10K issue Landscape black-violet, OMITTED PRINT almost through whole width of the sheet; perfect quality, certificate Zrinjšćak, unique! 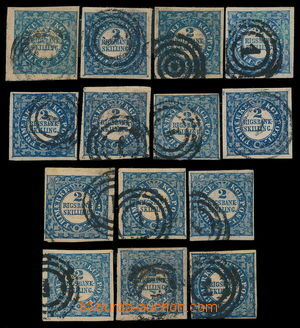 1944 Mi.161U, Francetic 12,50K black, IMPERF PB - block of 30, 1/4 from printing sheet before putting the gum; cat. 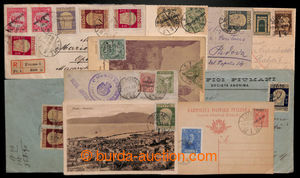 as singles 900€, rare multiple! 1861 Sass.23a, PROVINCE NAPOLETANE 20gr "giallo arancio", CDS NAPOLI; nice piece, minor faults, certificate Raybaudi, cat. 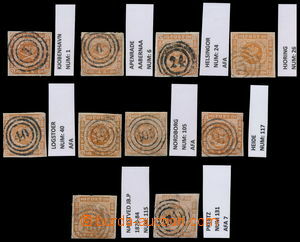 6.750€, rare stamp! 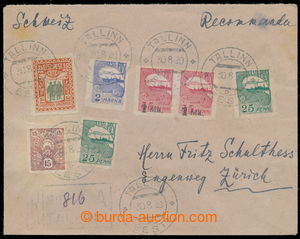 1840-1950 [COLLECTIONS] POSTMARKS collection of more than 600 various entires alphabetically sorted according to postmarks of post offices in territory as: BRETTO, FIUME, RISANA, RAGUSA, CHIUSA, BOZEN, GORIZIA, PROSECCO, SAGRADO, TRIESTE etc., many entires as Registered, or Ex, FP, entires sent from abroad, prephilatelic letters, mainly entires from period of Austria Hungary; various quality, more than 3kg of material!